It’s been a monumental year for Peace Alumna, Harriet Mills, who balances her national TV appearance with running a business, being a wife, and mother of three. Mills successfully pitched her national “paint and sip” company, Wine & Design, to a panel of famous investors on ABC’s Shark Tank, which aired this past May. Patrick Mills (left) with celebrity investor, Kevin O’Leary (center) and Wine & Design CEO, Harriet Mills (right). Harriet and her husband, Patrick, filmed their pitch in September 2016 in Los Angeles while she was seven months pregnant, and it wasn’t until eight months later that the duo found out that their segment was going to be broadcast, giving them only two weeks to prepare. Despite the scramble to prepare for the national spotlight, Wine & Design – as a business – is a well-oiled machine. 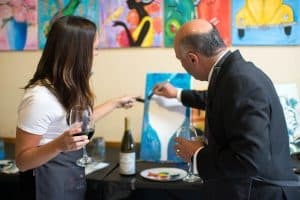 The business concept is a simple idea, where participants socialize with a glass of wine, while following step-by-step painting instructions from an artist-teacher. Each attendee then crafts a painting to take home when they leave. “You come in and have an actual conversation with your friends, pour a glass of wine, relax and paint a two-hour painting while you’re instructed by an artist-teacher,” Mills said. 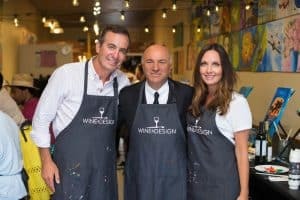 Harriet Mills (left) and Kevin O’Leary (right) drink wine and paint. Mills started the business in 2010 after a trip to Charleston, where she and her business partner attended a wine and paint class. After a little help from friends and family, the business was up and running, then quickly expanded out of Raleigh as the company franchised to become a national presence. As of today, Wine & Design has franchised 78 locations across the U.S. and Mills’ Shark Tank appearance will likely increase that number. Harriet and Patrick entertained offers from two of the show’s celebrity investors, or “sharks” – Kevin O’Leary and Robert Herjavec – finally accepting an offer from “Mr. Wonderful” (O’Leary). Mills is a natural conversationalist, on and off camera, and she attributes her success to studying Communication at Peace, where she received her degree in 2003. During her WPU interview, she reflected fondly of her time on Peace’s campus and the lifelong friends she made. Mills made sure to note how much of an impact the professors had on her, going out of their way to help her and every student, most notably Roger Christman, Associate Professor of Communication and Department Chair. For more news and feature stories, search #PrepareAtPeace on social media, or visit www.peace.edu/news.